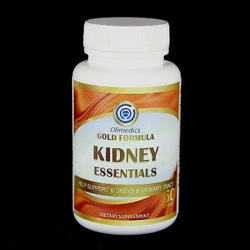 One of our Gold Formula™ products, Kidney Essentials™ is the collection of the most advanced nutritional science research, designed to bring you the most extensive benefits to kidney as well as urinary tract, and to improve critical functions of kidneys including excretion of metabolic wastes, re-absorption of vital nutrients, acid-base homeostasis, osmolality regulation, blood pressure regulation, and bormone secretion. KEEP OUT OF REACH OF CHILDREN DO NOT USE IF SAFETY SEAL IS DAMAGED OR MISSING. STORE IN COOL DRY PLACE. Active Ingredients: Organic Cranberry Extract, Astragalus, Birch Leaves, Buchu Leaves, Goldenrod, Horsetail, Juniper Berries, Gravel Root, Uva Ursi (herb powder), Nettle Leaf (herb powder), Java Tea (0.1% extract), High Orac Complex of Cinnamon Powder, Ginger Root Powder, Turmeric Powder, Green Tea Leaf Powder, Rosemary Powder, Grape Seed Extract, Wild Blueberry Powder, Red Raspberry Powder, Cranberry Powder, and Strawberry Fruit Powder. Other Ingredients: Vegetable cellulose, rice flour,vegetable magnesium stearate and silicon dioxide.